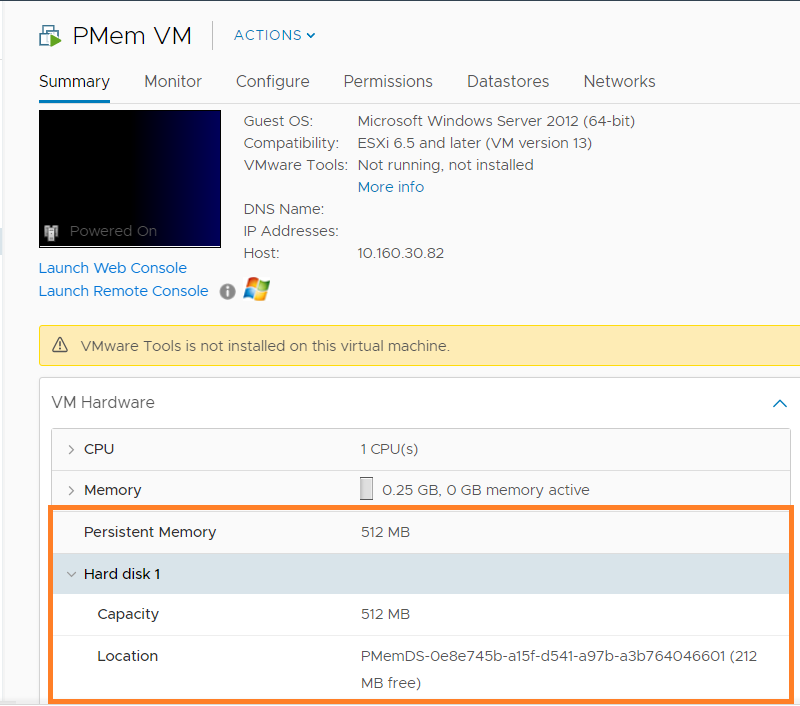 vSphere 6.7 : What is PMem and How vSphere DRS works with PMem configured VMs? vSphere 6.7 supports one of the exciting technologies on computer memory i.e. 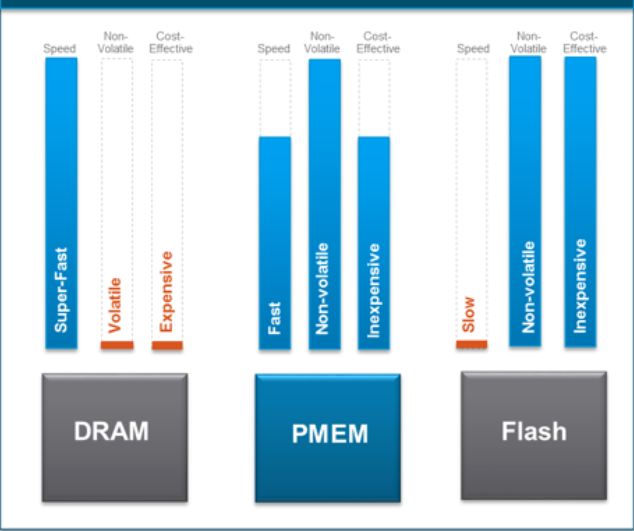 Non-Volatile Memory (NVM) or persistent memory (PMem). In this post my focus is on briefing what is PMem technology and explore how DRS works with PMem configured VMs. What is Persistent Memory (PMem)? In brief, PMem is next generation memory technology whose data transfer speed is as good as DRAM (50-300 ns, 100 times faster than SSDs) and unlike DRAM, it can even retain the data after reboots . If you ask me, it is going to greatly improve the performance of applications running performance sensitive workloads ex. analytics and acceleration databases etc. The virtual machines, which require low latency, high bandwidth and at the same time persistence are right workloads to be benefited from this technology. Below diagram highlights the 2 modes supported by vSphere. ii) Virtual Disk mode (vPMemdisk): This works with legacy/traditional VMs, no requirement of having hw version 14 and VM need not to be PMem aware. If you want to understand more about PMem technology , I would recommend you to watch this youtube presentation by VMware’s CTO Richard B. Note: I did simulate PMem on 2 hosts using a cool hack provided by engineering i.e. by running this esxcli command “esxcli system settings kernel set -s fakePmemPct -v 33”. Note that simulation must be used for lab or educational purposes only. William has written a nice article on the same as well. Now that we have required PMem simulated hosts, lets start exploring how DRS works with PMem. Since I did not have any PMem aware guest, as I said earlier, I explored PMem with DRS in virtual disk mode described above i.e. vPMemDisk, which works fine for legacy guest OSes. Below are my observations on the same. I created a VM with PMem of size 512 MB on DRS cluster. Below screenshot shows how PMem can be selected as storage. Below screenshot shows how PMem storage policy comes into picture. This policy gets selected automatically once you select “PMem” as shown above. Now lets take a look at the VM summary. The VM I initially created got registered on one of the hosts with PMem storage and I observed that DRS places (once powered on) the VM on same host, where it was residing. Then I created 2 PMem (same vmdk size) configured VMs and powered on. I see that DRS placed VMs on 2 separate hosts as expected. I had 2 hosts with PMem and a host without PMem. I put one of the hosts with PMem into maintenance mode, where one of the PMem configured VMs was residing. I observed that DRS migrated the VM to another PMem host as expected. Then I went ahead and put even 2nd host into maintenance mode. Since there is no any host with PMem by now, I observed 2nd host can not be put into maintenance mode. I played around both VM-VM and VM-host rules and I observed that DRS tries to satisfy rules but never migrates PMem configured VM to non PMem host even though rules gets violated. 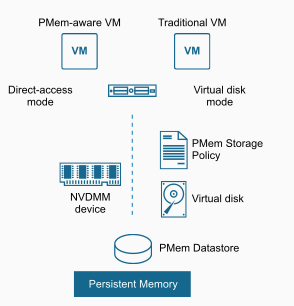 I could not explore more on DRS load balancing with PMem VMs but what I have observed is that DRS prefers recommending non-PMem migrations more overs PMem VM migrations. If it is absolutely needed, only then DRS recommends PMem VM migration to other compatible hosts. 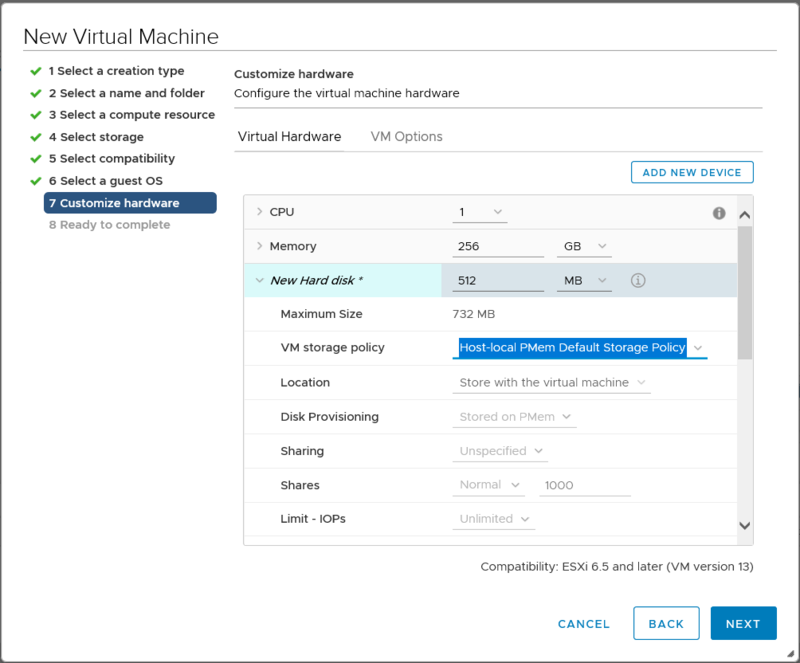 With vSphere 6.7, only one PMem local datastore is allowed per host. 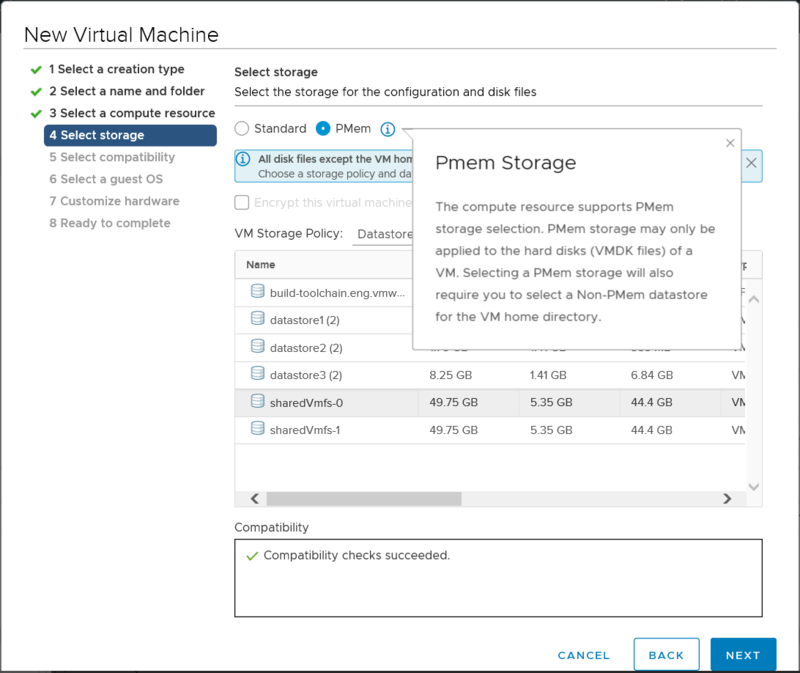 Normal datastore operations are not available on PMem datastores and vSphere H5 client also does not list PMem datastores under regular datastore views. Only operation available is monitoring stats. Though PMem can be configured on standalone hosts. However, it is highly recommended to use DRS. DPM (distributed power management) supports PMem as well. I hope you enjoyed this post. Please stay tuned for my another blog post on PMem, where I will discuss about creating PMem VMs using API.